Asus is planning another assault on the cut-price laptop market by using ARM's chips to help bring down the cost of the devices again. CEO Jerry Shen has said the company will be launching a machine based on the chip manufacturer's architecture, bringing a device that bridges the gap between smartphone and netbook. According to Reg Hardware, the CEO says the new device, which may launch for around £150, will help keep the company at the sharp end of the cut price laptop market, after the success of the early EEE PCs. 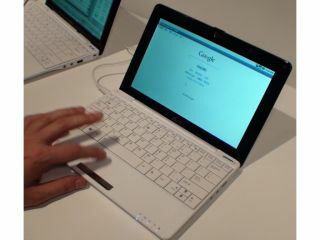 This hybrid device would traditionally have an even smaller form factor than a netbook, which nowadays packs a 10-inch screen on average, but would need smaller batteries thanks to processors sucking less power. The company has been seen demoing such a machine at Computex in June running Android, which would make sense as the mobile OS has obviously been optimised for chips that were created for phones. The likelihood is we'll get a UK release date of Q1 2010, so the next year could herald a year of even smaller and cheaper netbook - who would have guessed that?